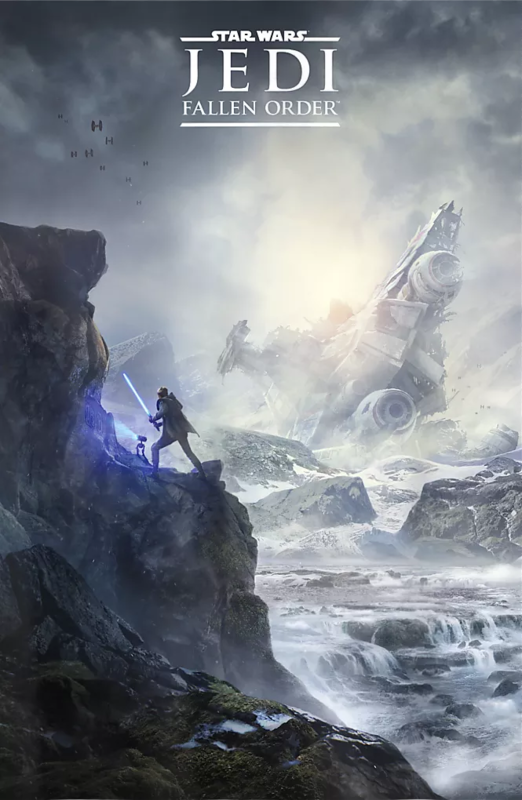 A new poster for Star Wars Jedi: Fallen Order has leaked online, just one day before Respawn’s story-driven adventure game is set to be officially revealed during a panel at the Star Wars Celebration event in Chicago. The image first appeared on Amazon, on a T-shirt of all things (as spotted by Twitter user Wario64). Aside from looking very, very cool, there’s a lot we can learn about the game from this new image, much like the official tease that EA shared a few days ago. Before we dive in though, take a look at it for yourself below if you’ve not seen it yet – it’s a beauty. At first glance it’s a pretty epic looking poster. We have a lone Jedi (presumably the Padawan who survived the order to eliminate all Jedi in Revenge of the Sith) stood on a jagged, rocky ledge. Water flows beneath him, and the ruins of a crashed ship loom in the distance. That ship seems to be, as many Star Wars historians have already pointed out, a Venator-class Star Destroyer. This type of ship was previously a Republic Attack Cruiser before the Empire rose up and took over. As we know, Fallen Order details the Empire’s rise between Revenge of the Sith and A New Hope, so the design of the vessel certainly fits the era of Star Wars history. These vessels would eventually go on to be redesigned as the iconic Victory-class Destroyers, one of which we see at the very start of Episode IV. How exactly did this ship crash here? Is the Jedi in the poster looking for it, or was it looking for him before it met its untimely end? The plot thickens when we consider the T.I.E fighters swarming in the sky above. Are these ships hunting for our hero? 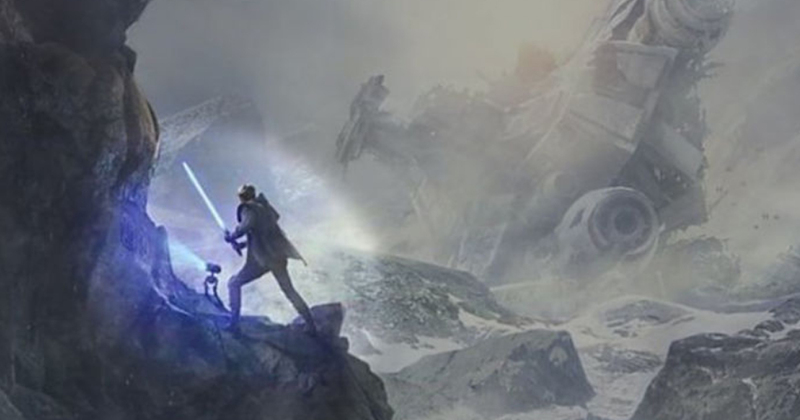 We know that Fallen Order will involve the player attempting to survive in a world where the Empire has orders to kill Jedi on sight, so it makes sense that the T.I.E Fighters are scouting for him. Then again, they could just as easily be searching for something valuable on the crashed Star Destroyer. Something our hero is also looking for, perhaps? Going back to the Jedi, you can clearly see he has a little droid companion. It’s not clear exactly how this bot will factor into gameplay, but I’d imagine it’ll serve as some kind of guide. 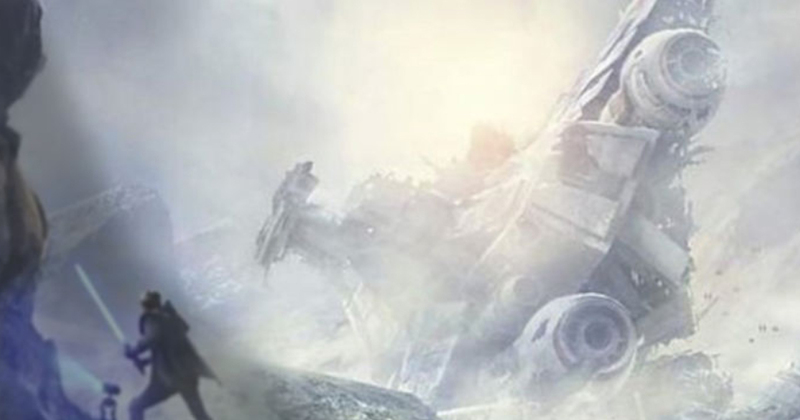 The fact the droid seems to be scanning some old runes suggest it’ll be our source of lore in Fallen Order, and reinforces the idea that the Jedi in the poster is looking for something. What of the runes in the image? They look an awful lot like the ones we see in the game’s original tease from a few days back (see below), which were confirmed to be ancient symbols from a bygone age. 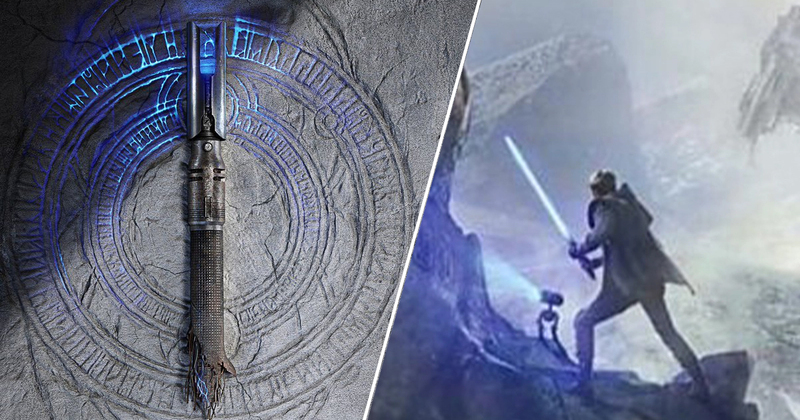 These runes have been likened to some old Yavin temple concept art from Ralph McQuarrie, which certainly suggests some kind of connection to Sith, or an incredibly old Jedi order. I’d imagine that these runes, and this ancient order (whatever it is) will play a very big role in Fallen Order. The fact the characters appear on the side of a cliff implies that as we play through the game, we’ll be able to track down these runes in various locations to discover new weapons, loot, or perhaps something far more integral to the story. All in all, I certainly get the vibe that Fallen Order will center around our hero attempting to find someone – or something – important to the Jedi, while doing their best to avoid detection from an Empire that wants him eradicated. We’ll see a lot more than a leaked T-shirt when the reveal panel kicks off on Saturday (April 13) at 7:30pm in the UK.